ELVA-1 Millimeter Wave Division announces another successful installation of its specially modified PPC-1000 Gigabit Ethernet mm-wave link for the Czech Republic. Czech networking and communications technology distributor ATLANTIS Datacom has installed a Czech Republic version of ELVA-1's Gigabit Ethernet Radio Link for Internet Service Provider JHComp in Jindrichuv Hradec, Czech Republic. This special version of ELVA-1 model PPC-1000 is produced specifically for operation in the Czech Republic, where the authorized frequency bands are 74-76 and 84-86 GHz. A standard PPC-1000 intended for world use operates in the 71-76 and 81-86 GHz frequency bands. 74-76 and 84-86 GHz radio frequencies can be used in the Czech Republic for operating wireless links without individual authorization. A Concept of General Authorization for radio frequency use and for the operation of equipment for fixed radio systems in the 74-76 GHz and 84-86 GHz bands was issued by the Czech Republic Ministry of Telecommunication on April 21, 2008. This Concept authorizes Internet Service Providers to use these bands, and stimulates innovations in equipment developed for them. An advantage of the 74-76 and 84-86 GHz frequency bands is the freedom from interference from other nearby radio links, even those operating in the same bands. Multipath reflections are non-existent at these frequencies, and the narrow beam width of the Cassegrain Antenna allows many radio links to work simultaneously in the same area. One condition of the Czech Concept is that the radio systems (stations) may operate only with minimal antenna gain of 43 dBi and antenna input power of 30 dBm maximum. ELVA-1 PPC-1000 Gigabit Radio Links satisfy these requirements. Martin Šmrha, Wireless Product Manager at ATLANTIS Datacom, stated, "ELVA's ultra high speed radio links are a perfect solution for enabling JHComp to provide a high speed interconnection between two remote networks. The PPC-1000 meets all of its declared specifications completely. The installation of two radios to cover a 6 km link distance took only a few hours. There is no indoor unit, and the outdoor unit is connected directly to a switch or router by customer-supplied fiberoptic cable." These point-to-point links are equipped with an SNMP management function, allowing a network administrator or technician to remotely control the operating parameters of all PPC-1000-E radios in the network from a central location. "We have been very pleased to find that the PPC-1000 antenna radomes have a special covering which prevents snow from sticking to them," Šmrha added. ELVA`s PPC-1000 digital radio links provide full duplex wireless Ethernet data pipelines that are equivalent in capacity to 512 E1 lines or 2 &#1045;5 lines in PDH. The operating distance of these Radio Links varies from 1.0 to 7.5 miles, depending on the LOS path and rain intensity. 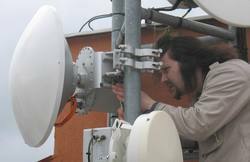 Their conformity to ECC requirements allows all European Countries to use PPC-1000 Gigabit radio links for wireless connections to remote regions. Their fiber-class data performance, ease of installation and affordable cost make PPC-1000-E links the ideal solution for WiFi or mobile network backhaul, business WAN or IP telephony gateway connections, metropolitan area networks and rapid-deployment emergency communications. Founded in 1993, ELVA-1 Millimeter Wave Division is a privately-held, internationally renowned manufacturer of millimeter wave integrated components, subsystems and test equipment. In 2000, ELVA-1 began aggressively expanding its product range into millimeter wave telecommunications products, such as 42GHz, 70/80 GHz and 94GHz transmitters and receivers, high gain antennas and other advanced wireless communications products. A complete overview of ELVA-1's capabilities can be viewed at http://www.elva-1.com. Atlantis Datacom is a networking and communications technology distributor, representing more than thirty worldwide manufacturers in the Czech Republic. It was founded in 1996 as a sister company of Atlantis Telecom. Both companies act today as one, sharing resources, facilities and know-how. Their gross income for 2007 was almost 13 million USD. Their broad product base allows them to offer complete communications infrastructure solutions for enterprise, carrier and service provider customers. To learn more about Atlantis Datacom, please visit http://www.atlantis.cz. JHComp is a well-recognized Internet Service Provider serving the area around Jindrichuv Hradec, Czech Republic. They provide internet connectivity and voice services to both residential and business customers. In addition to ISP service, they provide hardware and software IT solutions, network management services and CCTV solutions.